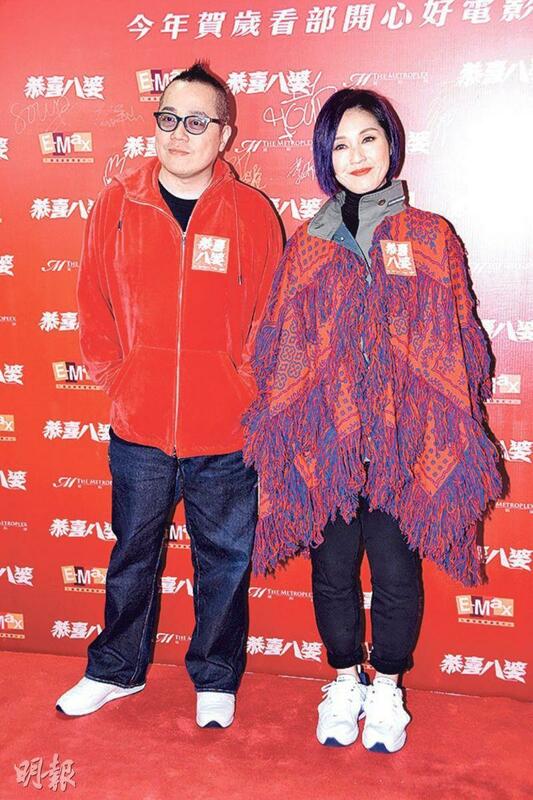 The Lunar New Year film MISSBEHAVIOR (GUNG HEI BAK POR) two nights ago held a premiere. The director and the "nosy b*tches" in the film Miriam Yeung Chin Wa, DaDa Chan Jing, Hanjin Tan (Chan Woon Yan), Tsui Tin Yau, Susan Shaw Yam Yam, Jo Kuk Cho Lam all wore red in support. Sei Gor Patrick Tse Yin also attended. Chin Wa revealed that for the Lunar New Year he would take his son to learn to ski. She too was a skiing novice. When suggested that her husband could teach her, she said that her husband would not bother. There truly was a difference before and after marriage! Speaking of her husband Real Ting Chi Ko going on an all guys ski trip to Hokkaido, Chin Wa said that her husband would go with her to work in Australia after that. However for the Lunar New Year she would take her son to learn to ski. She said that she did not know how to ski either and took a mock skiing lesson in Hong Kong. "I want to have a breakthrough before my 45th birthday, but I look too old for it." Would she ask her husband to teach her? Chin Wa said, "My husband wouldn't bother, why would he wait for me? The difference before and after marriage is waiting and not waiting!" As for her February 3rd birthday, Chin Wa said that it would be the Lunar 29th. She had to work on a commercial before and did not have time to do her New Year shopping, that day she probably would have to get up at 9AM to do that. Before that she even had to pull an all nighter to clean up around the house. The government invited artists like Chin Wa, Alan Tam Wing Lun to shoot videos to cheer on the medical personnel that has tirelessly been taking care of patients. However online critics said that artists would not go to a public hospital and would not understand the pain. Chin Wa responded, "My stance is I was invited to the shoot, my own intention was to cheer on the workers on the front line. Earlier for the 150th anniversary of the firefighters I also shot a video to cheer them on. I was a nurse before, the stress at work was not something that everyone would understand -- like taking care of 50 patients on one shift. I of course understood the pain, my goal was to cheer them on, for people to understand and say 'thank you'. I don't think much about anything after that. Actually all first responders deserved to be thanked!" Chan Jing said that she has already seen her performance in the film. She felt that her acting and her figure have improved. Speaking of the series GUARDIAN ANGELS' Kate Tsui Tsz Shan role originally being hers but the switch was made after her acting was incompatible, DaDa admitted that it was two years ago. At the time she was constantly dizzy from Meniere's disease, after one day at work she quit. However she talked about it with TVB before making the decision. "Luckily the series response has been good, and I really like Tsui Tsz Shan!" Did she have to make compensation? DaDa said, "No, instead they paid more than one day salary. When I got it I thought it was a lot. I was very pleased!" Would she make another series now that she has recovered? She said that TVB asked her to make other programs. With suitable characters she would like to try making a series. After the premiere the cast celebrated Chan Woon Yan's belated birthday. His "good friend" in the film Tin Yau along with Hanjin's wife gave him a birthday kiss.